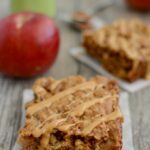 These Apple Cinnamon Breakfast Bars are easy, kid-friendly and full of protein and fiber. They make a healthy breakfast or snack and can be eaten on-the-go! In a bowl, combine the first 6 ingredients and mix well. Spoon into a greased 9×9 pan and bake at 375 degrees for 20-25 minutes. Be sure to chop your apples small. If you’re worried your bars will be too crumbly, you can reduce the apples to 1 cup and add an extra egg.